Vinyl Brite cleans and restores old vinyl to a like-new appearance while leaving a protective coating that will help prevent future weathering. Contains UV inhibitors to screen out the sun's damaging rays and help prevent fading. Simple spray-on/wipe-off application. Special polymers prevent vinyl from drying out and cracking. 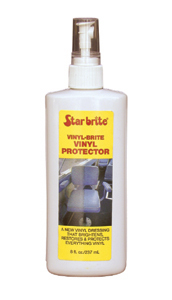 Safe for all vinyl applications. Will leave vinyl shining and protected.